Managing risk is required for many farm enterprises to be profitable. Contractual arrangements — such as livestock leases — can be crafted to lend or transfer capital, while also sharing risk. The terms of the agreement depend on the contributions of the owner and caretaker, as well as the motivation for the lease. A lease agreement may be the means for an older owner to compensate a livestock caretaker. A pasture producer or owner may also use a livestock lease agreement to generate income without committing labor or additional capital. 1) The owner must be willing to risk some capital. 2) The owner and caretaker should have mutual trust and confidence in each other. a) The caretaker must convince the owner that he or she has the managerial ability, honesty, and integrity to capably manage the livestock enterprise. b) The caretaker must be confident that the owner will deal fairly and honor the contract arrangements for shared returns. 3) The owner must be convinced that the return on investment in livestock, fences, and buildings will compare favorably with investments made elsewhere. The stocker owner may want to check references for the caretaker, and the caretaker may want to investigate the owner’s reputation for fairness and honesty. • When does the agreement start? How long will it run? • Is it automatically renewable? • What is the expected stocking rate? • When and how must termination be given? What are grounds for termination? • When and where will the agreement be annually reviewed? • Is a partnership intended? • Which party pays for feed, water, care, veterinary services and medicine, fencing, etc.? Which party provides the feed, water, care, veterinary services and medicine, fencing, etc? • What is the share of the output for each party? 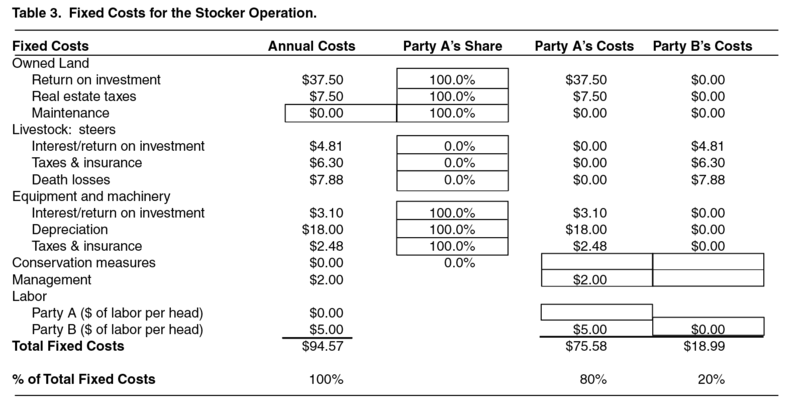 How will stockers be priced if one party buys stockers from the other? • When and where will the share of output be divided? • What will determine the amount of death loss for each party? How is death loss proven? • Should stockers be insured? Who will carry the insurance? • What facilities will be used? • Are there special agreements on feeding/handling of stockers? • Will incentives be provided for doing a “good” job? Will disincentives be provided for doing a “poor” job? • What records will be kept? How will animals be identified? • How will extenuating circumstances (such as drought, hail, or major health problems) that are not the fault of the caretaker be handled? • How will disagreements be settled? Is there a way for both parties to get out of the agreement? • If the owner terminates the agreement prior to the agreed-upon end point, how will the caretaker be compensated for expenses up to the date that the cattle are removed from the producer’s premises? • Are production improvements needed? If so, who will pay for them? 1) Labor. A party who furnishes the labor for growing all the feed and providing the temporary pasture furnishes much more than one who just feeds and checks the livestock. The labor requirements on timber pasture are higher than open pasture. 2) Pasture. The value per acre of pasture varies widely. 3) Machinery and equipment. The value of the machinery and equipment depends on the acres of temporary pasture produced and the amount of roughage harvested. An infinite number of possible arrangements for sharing the income from livestock and land and the other resources used to maintain them could be developed. Therefore, it is important that both parties itemize their expected contribution and value. Table 1 provides four examples. The contribution from each party may vary considerably as outlined in the examples. Individual circumstances may cause the percentages contributed to appear more varied than they actually are. Typically, cattle are weighed on the truck with a 2 percent to 3 percent pencil shrink, or the pay weight at the sale barn is taken. A satisfactory method of weighing cattle in and out should be agreed upon in advance. Arrangement 1. For Party B, the returns on this arrangement depend on the gain plus selling price of the cattle. For Party A, the returns depend on the amount of gain relative to costs incurred. Arrangement 2. 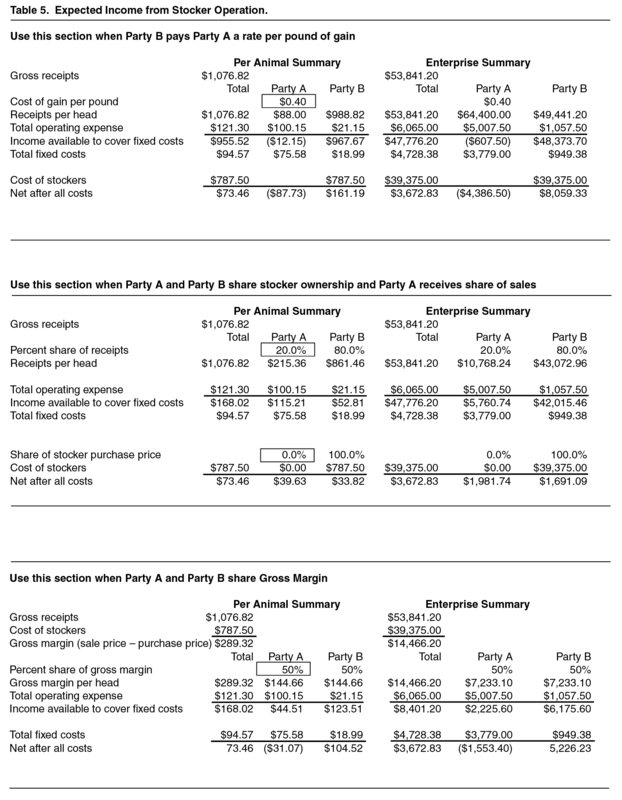 Because Party A and Party B split the variable costs, Party A shares the risk of price change and is no longer guaranteed a set price per pound of gain. The income of each party depends on gain and stocker selling price. Arrangement 3. The price per pound that Party A receives may vary with the price of cattle. Party B, the owner of the cattle grazed in the summer, faces a seasonal decline in the price of cattle as contrasted to a seasonal increase for cattle grazed on wheat pasture. Arrangement 4. Usually, this arrangement is between one party who is skilled in buying and selling cattle and a party who has wheat pasture. Party A pays Party B a commission on buying his or her share of the cattle, and Party B pays Party A for his or her half of the wheat pasture. A per head charge for labor and management for Party A may be specified. Calculating the expected costs and returns allows the leasing parties to explore different share arrangements. 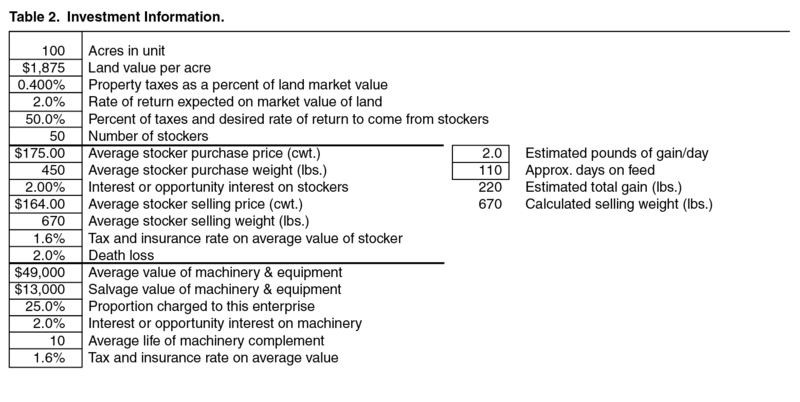 Tables 2 through 5 summarize the details of a stocker leasing arrangement, outlining the investment data, fixed costs, operating expenses and expected income to be shared by the two parties, referred to as Party A and Party B.2 (A spreadsheet incorporating these worksheets is available at beefextension.com under Stocker Cattle, Calculators.) The individual fixed costs, operating expenses, and income are estimated and stated on an annual, per head basis. The share percentages in the example correspond to arrangement 2 in Table 1. 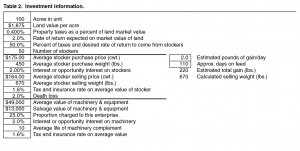 The first step is to enter the data explaining the investment in land, livestock, buildings, and equipment (Table 2). Fixed costs are incurred with the ownership of stocker cattle. These costs will not change with regard to herd size. The fixed cost section includes land, equipment and machinery, conservation, management, and labor. The numbers in the boxes must be provided by the user of the spreadsheet. Other figures are calculated automatically by the spreadsheet program. 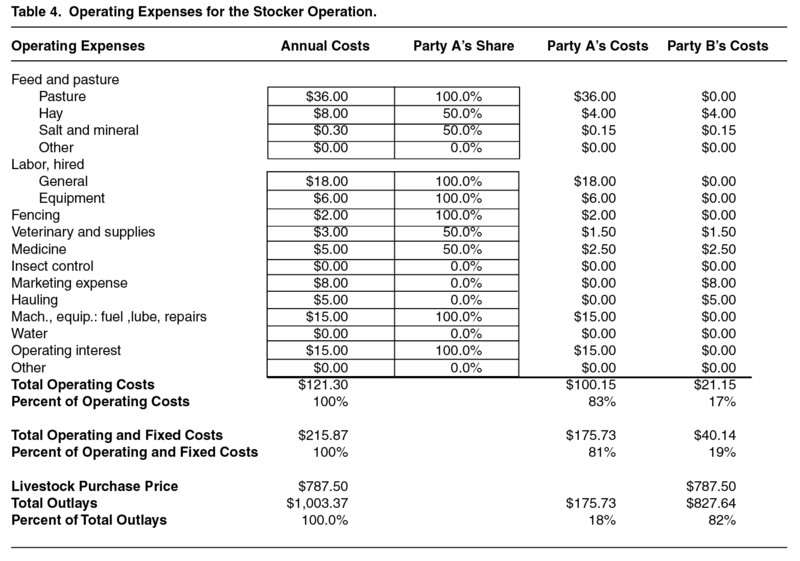 The data used to calculate the fixed costs associated with the stocker operation are shown in Table 3. Variable costs, referred to as operating expenses (Table 3), are incurred with the day-to-day operations. These costs are directly related to operation size. Operating expenses include feed and pasture, labor, fencing, veterinary and supplies, insect control, marketing expense, hauling, machinery and equipment, water, and operating interest. Pasture costs will include establishment costs if, for example, a small grain crop is planted and grazed out. Otherwise, pasture costs should reflect the additional fertilizer applied to compensate for nutrients removed through grazing. For native pasture, most maintenance costs could be included in other categories, such as fencing and labor. Once the annual costs are estimated, the parties must agree upon the contribution each will make toward meeting those expenses. 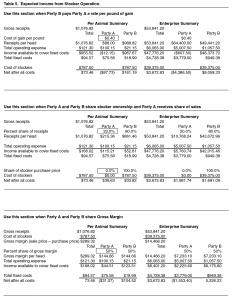 The percentage to determine Party A’s portion is entered and multiplied by the annual costs. 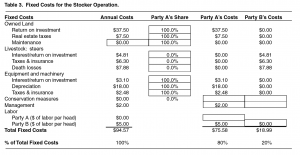 Subtracting Party A’s costs from the total annual costs derives Party B’s costs. 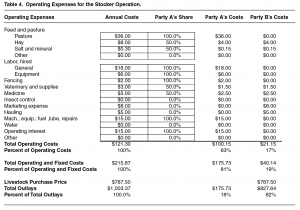 The total fixed costs and operating expenses are summed and each party’s cost is divided by the total costs to determine the percentage of fixed costs and operating expenses contributed by each party. A stocker lease is a common way for a cattle owner and caretaker to pool their land and livestock resources. If the arrangement is properly laid out ahead of time, the lease can help each party share production risk. The lease should be a written document and cover all parameters of production and possible situations that could arise during the duration of the contract. The parties entering into the arrangement should clearly define their expectations with respect to sharing of costs and receipts. Party A and Party B should choose an arrangement that best matches their resources and desired returns. 2 See OSU Extension Fact Sheet AGEC-243, Using Enterprise Budgets in Farm Financial Planning, for additional information on fixed costs and other budget components.